May Day Bank Holiday afternoon went to Broomfleet Washlands with ML and RL. As ML needed Variable Damselfly and Hairy Dragonfly they were our prime target. Although warmer then last week it still was overcast and no too hot. Started at the southern edge were I’d seen Variable in the past. Struggled to begin with but disturbed the occasional teneral damselfly. The first few were Azure but eventually located a few Variables and eventually got good enough views to satisfy all three of us. Moved onto the drain along the northern edge where I’d seen Hairy Dragonfly before but weren’t able to locate any hawking over the water or flushed one from the grass. However wasn’t a total disappointment as there were 3+ Marsh Harriers over the Washlands and 5+ Common Buzzards over adjacent farmland and we sat on the flood-bank to enjoy the spectacle. 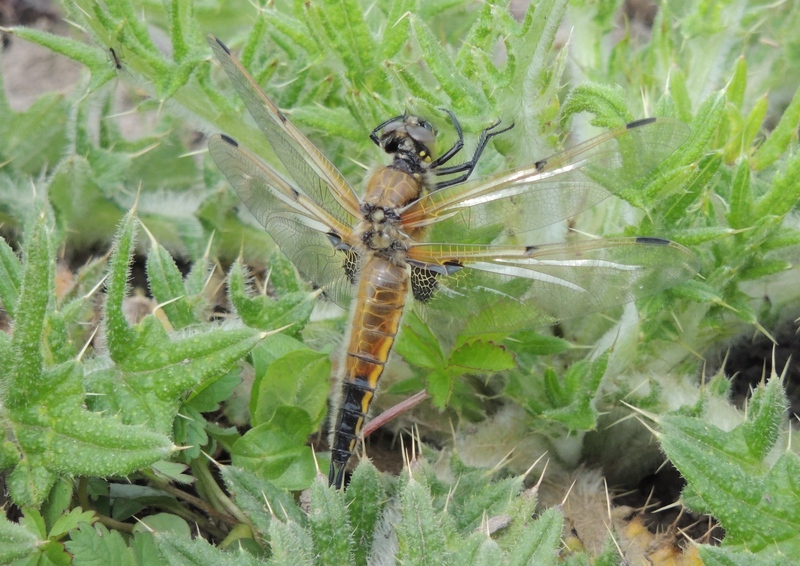 Walking off we disturbed a recently emerged Four-spotted Chaser Libellula quadrimaculata.